Barullo de La Alqueria: Classic Fino stallion not shown in the United States. Natural collection, exceptional mechanics, upright carriage and outstanding phenotype. His third years foals are undergoing saddle training in 2010 and show to have his outstanding talent and beauty. Beech Tree Countessa is a legendary fino mare in the Paso Fino breed. She captured the National Championship Title for 4-year Fino fillies in 2001 and then came back in 2002 and won the National Champion Fino Mare, National Champion Fino A/O Mare as well as the Grand National Champion Fino Mare and Fino A/O Mare. Beech Tree Countessa is a proven broodmare, dam of the famed La Contessa de DL, who was 2006 National Champion Fino filly and 3rd in her age group at the 2007 Mundial. 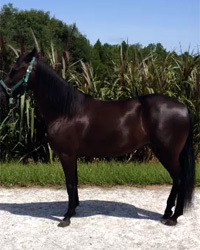 Beech Tree Countessa is well-bred, naturally gaited, quick with outstanding hock action and easy to ride. She passes these talents and her natural collection to her offspring.